Jewel Match Solitaire Collector's Edition is a newly released solitaire game in a collector's edition. This game is really worth checking out if you are a solitaire fan (or even if you are not - it is one of the best ones out there to try). In this game, you are going to travel through an ancients land and rebuild destroyed castles. But there are only 8 castles to rebuild and a whole lot of levels to play in between them. There are over 320 levels in total. You begin with the basic solitaire game but there are other types of solitaire games (Klondike, Pyramid, Spider, etc...) to unlock as you proceed through the game. The CE version gives you additional levels (120 more levels) in the bonus part of the game. 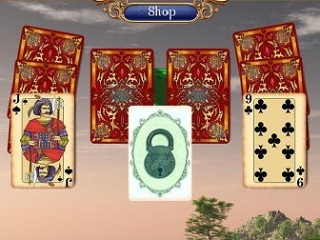 The game makes it even better by challenging you with locked cards that need a special tool card (Keys for a Lock card or Scissors for a Ribbon card, for example). Or you can find cards with coins, which, once obtained, allow you to buy power-ups in the store (Wild Card, Undo, Shuffle). The game offers a strategy guide (which is pretty unusual for this type of games) and 21 trophies to earn. You can play it in Relaxed, Normal, or Hard (timed) mode. Jewel Match Solitaire Collector's Edition really stands out among the other solitaire games because of a great selection of different types of solitaire games and all kinds of tasks and challenges along the way. The game's CE extras actually count for something and might be worth the purchase for you. Check it out for yourself! This is Jewel Match Solitaire review. Download this game here.